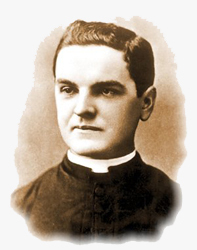 The Knights of Columbus was founded by an Irish-American Catholic priest, the Venerable Father Michael J. McGivney in New Haven, Connecticut. He gathered a group of men from St. Mary's parish for an organizational meeting on October 2, 1881 and the Order was incorporated under the laws of the U.S. state of Connecticut on March 29, 1882. The main benefit of being a Knight is to being part of and helping one of the largest charity organizations in the world. Also as a member of the Knights of Columbus you and your family enjoy other benefits, including 12 free issues annually of Columbia magazine, the world's largest Catholic family magazine, eligibility to join the Knights of Columbus top-ranked life insurance program, and many more family and personal benefits, seen on the Supreme Councils site here. Membership in the Knights of Columbus is open to men 18 years of age or older who are practical (that is, practicing) Catholics in union with the Holy See. This means that an applicant or member accepts the teaching authority of the Catholic Church on matters of faith and morals, aspires to live in accord with the precepts of the Catholic Church, and is in good standing in the Catholic Church. Application blanks are available from any member of the Knights of Columbus. Make contact with us for inquries to join our council by phone at 321-268-2764 or email us at KofC5667@gmail.com. If you are intrested to learn more about our council try reading our events page and feel free to look over some of our newsletters.